Need a European restaurant website builder to advertise your services on the web? But you can't make your dreams come true, since you have no time and web development skills? Here is a great product to meet your demands! No need to learn web development or use services of web design professionals. 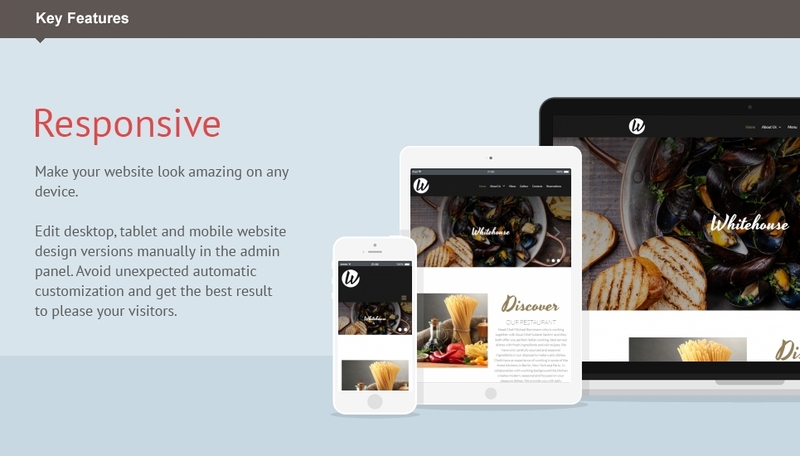 Uncover our top-quality European Restaurant Responsive Moto CMS 3 Template matching your services exactly. Wondering why are we so sure that our template, based on Moto CMS 3.0 is what you need? It couldn't be any easier! The manageable admin panel will allow you to make all the changes by yourself, from any color scheme adjustments to adding some extra pages. You don't need to gain special skills, we have already done everything for you. Purchase our European Restaurant Responsive Moto CMS 3 Theme and establish a website in several clicks - set up, add your text and pics and enjoy.